Hero is known worldwide as a leader in the fruit spread industry. With their new Hero Fruit Spreadables brand, they are pleased to introduce an exciting extra smooth, seedless fruit spread – designed especially for 100% NATURAL PB&J SANDWICHES. Hero Fruit Spreadables spread easily, and are ideal for a quick lunch or snack. Hero Fruit Spreadables contain NO High Fructose Corn Syrup and NO Artificial Ingredients and are available in four great flavor blends: Strawberry Red Currant, Mixed Berry, Strawberry Banana, and Cherry Banana. Hero Fruit Spreadables are available exclusively at SuperTarget stores nationwide for a suggested retail price of $2.49. Fruit Spreadable sampling events will take place in SuperTarget stores on Sunday May 15, 2011. Here's the awesome gift basket I received to host my own Hero Fruit Spreadables House Party! 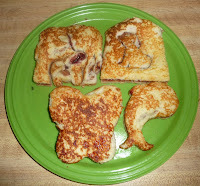 Here are the adorable PB&J Jammers we made with the sandwich cutouts included in the gift basket. And here is the Fruit Roll I made from the recipe card I got in the gift basket. I actually made two of these, which was a good thing because there was only about 3" left after everyone was done! As you can probably tell from the above pictures we really like the Hero Fruit Spreadables. They were a really big hit with my daughter because she can't stand any sort of seeds or lumps in her jelly/jams. With the Hero Fruit Spreadables she is able to enjoy strawberry fruit spread now. I myself was really impressed with the flavors of the spreads. Even without the High Fructose Corn Syrup they still had a great sweet taste, I assume this was from the natural sweetness of the fruits. I prefer products without the High Fructose Corn Syrup so we'll be stocking these for sure. My daughter really like that they had characters on the jars too. She kept asking for the "Dora Jam". The size of the jars is just right for holding her little toys and trinkets so these will be sticking around for a long time (or at least until the labels peel off). 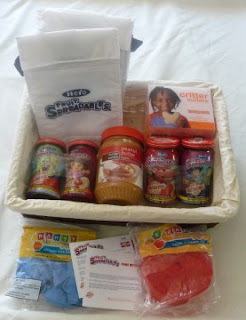 Win it: One lucky reader will win the very same gift basket I received (Includes 1 each of the 4 Fruit Spreadables fruit blends, peanut butter, sandwich cutters, balloons, streamers, recipes, 2 reusable lunch bags, and a $5 Target gift card so you can buy fresh bread.). This giveaway will end May 19th at 10 PM EST. The winner will have 48 hours to respond to my email. If no response, a new winner will be chosen. Open to residents of the US. Mandatory Entry: (Mandatory entry must be completed first or bonus entries don't count.) *Tell me who in your house would enjoy this the most. Disclosure: This review was made possible by Mom Spark Media. I received the products above for my personal review. This blog post is not a paid post and the honest opinions stated are my own. These look awesome! We would love to try them! the kids in my house would definatly enjoy these the most these look delious. My daughter would love to try this! My daughter Grace would love this! Well as for who would enjoy this most in my house, I THINK my daughter wins because, like your daughter, mine hates the seeds and skin and stuff. BUT my hubby would ALSO really enjoy this stuff. The Dog will probably like it the most when he sneaks the kids sandwiches off hte counter. My husband would love this! He's the PB&J and jelly roll maker in the house! Lil girl would love love love this!! Like you on FB as Carmen A. All three of my kids would love this most, but my oldest daughter is the big eater in our family, so I'd have to say her. hm, I don't know who'd enjoy it more - me or my daughters! they LOVE PB and J and this sounds awesome. thanks for the giveaway! My three yr old would love these! She loves didn't kinds of spreads! thank you for another yummy giveaway! there's no doubt that everyone in my house would enjoy this if i win, but i really think i would enjoy it the most! lol i'm nothing but a big kid sometimes! My 3 year old would love this! My son would enjoy this most. My three girls would love this! My daughter is a pb&j monster at our home, so she would enjoy it the most. I do solemnly swear I would love it the most. I already follow on FB as Audrey F.
My son would love this the most. He is our PB and J guy! My daughters Savannah and Sabrina would love this. Thank you for a wonderful giveaway. My 5 yr old son would enjoy this the most since he loves P & J and we've never cut our sandwiches into shapes. I would actually enjoy it the most. Lol. I'm a big kid at heart I swear. I cannot tell a lie: ME! I would enjoy this the most! My son Max would sure like this! He likes PB & J and cream cheese and jelly toast for breakfast!! Now following with GFC as "Scoop"
I would! I love a good pb and j for a midnight snack! I and my granddaughter would enjoy this. I think my daughter would love this! !